Do you think your dog has what it takes to be a member of the military? Today, I'd like to share a fun competition for dogs that is sponsored by Chuchill Insurance. If you think your pooch has what it takes, I encourage you to enter the contest! There are some great prizes to be won. A new TV series called Animal Heroes has been helping to answer this question, showing audiences some of the most inspirational and dedicated animal companions currently serving alongside human handlers in the British military. It’s been a real delight seeing how these animals work, especially when the risks are so high, and seeing the amazing attachment which soldiers have to their companions throughout the process is particularly heart-warming. Naturally, such a show does make you curious and questions of ‘could my pet achieve the same results with the right training’ are bound to circulate. Churchill Insurance (which sponsors the programme) has set out to answer this question with its newest competition: Churchill’s Dog Boot Camp. The insurer with the famous canine mascot, they’ve drafted John Fitzpatrick, a recently retired Warrant Officer and dog handler in the Royal Air Force Police, to help give owners establish whether their dogs have what it takes to be a top military recruit. The expert handler has made a series of videos detailing how to train your pooch in military style, giving every dog a chance to experience life ‘in the ranks’. The premise of the competition is then to simply watch the videos and attempt to replicate the results with your own furry friends. Record the results and upload them onto the competition’s website where they’ll be viewed and dog boot camp finalists selected by a public vote. Four lucky dogs (and their owners) will be chosen for the final test: to see if their pet really could handle it in the military. 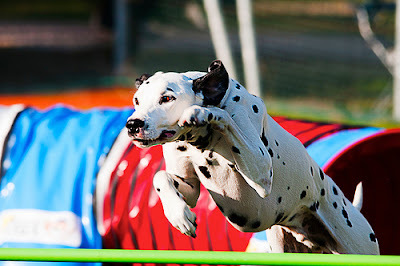 Tests include jumping over hurdles, searching for and retrieving toys, walking at heel and being sent away to markers – all tests which simulate real-life military situations which trained dogs (such as those featured in the programme) would be expected to handle. The last episode of Animal Heroes will air on ITV at 8pm on 18th June. Applications for Churchill’s Dog Boot Camp Competition can be submitted until 11.59pm on 14 July 2013. Disclosure: This is sponsored guest post. Pawsitively Pets was compensated to share this information with readers. However, we only share things that we support or believe might be of interest to our readers. Sounds like fun. We will check it out. We probably can't enter but it may give us some fun ideas. Have a terrific Tuesday. Oh I visited this site .... great the "drill-instructor"-dog looks cool! R moms gram paw hada German Shepherd, Pete...who served during WW2....him was over seaz and was a "messenger dog" ...rock on Pete !!! I feel some great competition coming on!